As is usually the case when I write about Aulani, this Yesterland article is not about something that’s gone. Well, maybe it is. When ‘AMA‘AMA opened, it suffered from negative reviews. Based on my experiences with dinner and two lunches at ‘AMA‘AMA, those dining disappointments should now be a thing of the past. 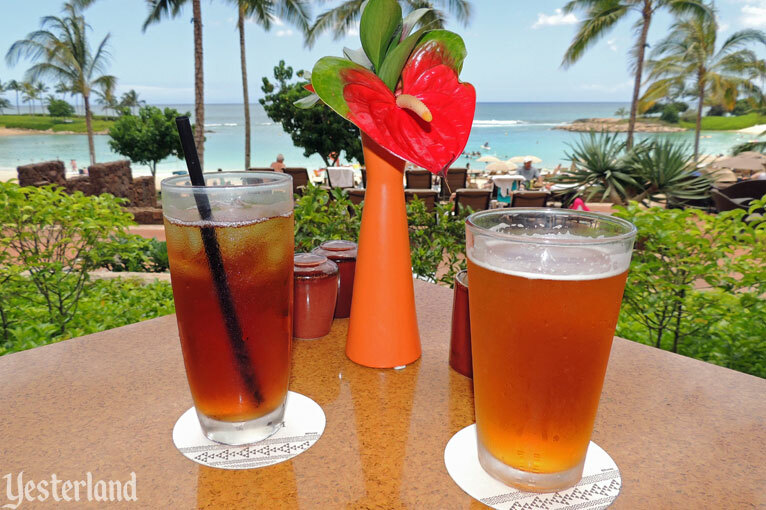 ‘AMA‘AMA, the signature dining restaurant at Aulani, is named after the ‘ama‘ama, the local striped mullet fish which can be seen jumping out of the water in the lagoons of the Ko Olina Resort. ‘AMA‘AMA makes a much better restaurant name than Striped Mullet (which sounds like a hairstyle). 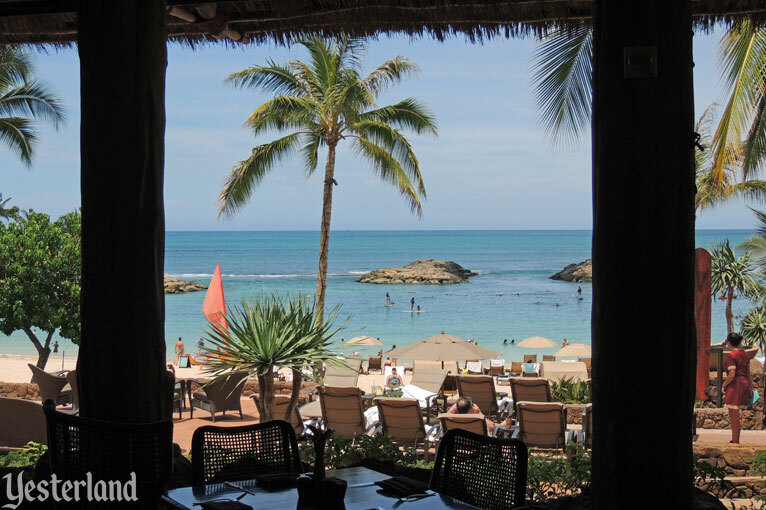 Ko Olina is on O‘ahu’s leaward coast, where fishing settlements date back to the 12th century. 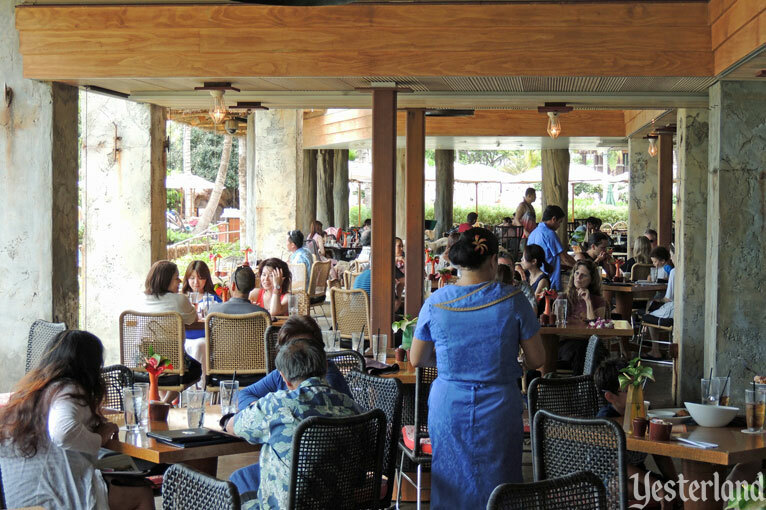 According to the story, the restaurant was a Hawaiian family’s beachside fishing settlement. The oldest part goes back to the 1890s. The family added a second house in the 1920s and two more in the mid-20th-century. The newest part, a contemporary house, is quite recent. An old fish cleaning tank serves as a fountain, while sleek, modern furniture continues the mix of old and new. It’s not simply an effort to be playful. It’s about honoring a family—even if it’s a fictional family—that carries their traditions through generations. To be honest, the story gets lost inside ‘AMA‘AMA—and most diners are probably completely unaware of it. 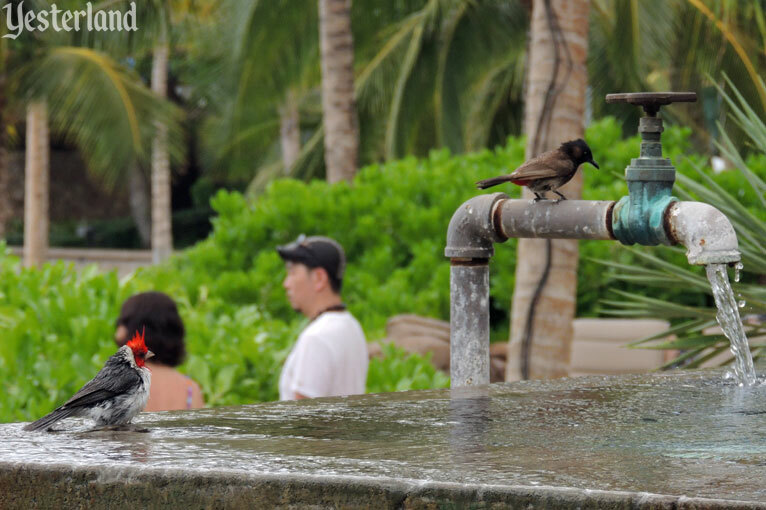 Wild birds like the fountain as a birdbath. If your table has a view of the “old fish cleaning tank,” they will entertain you. 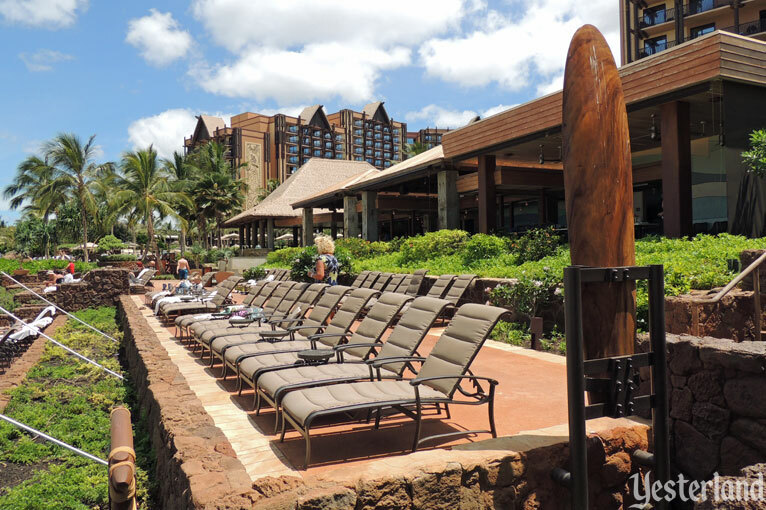 The star view is the beach cove at Ko Olina lagoon 1, just beyond the restaurant. 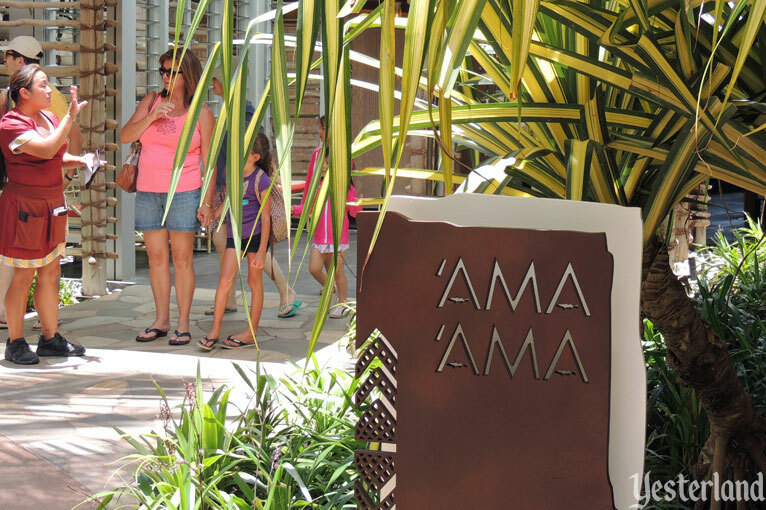 Unlike Disney’s signature restaurants at Walt Disney World and the Disneyland Resort, ‘AMA‘AMA serves breakfast, lunch, and dinner. Our first meal at ‘AMA‘AMA was dinner. We shared an appetizer before our entrees. 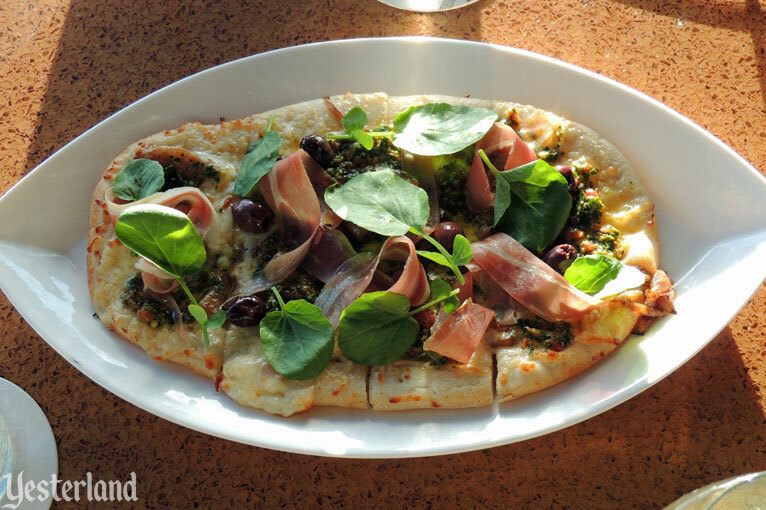 Our Shaved Serrano Ham Flatbread was delicious, but rather oily. I ordered the Hawaiian Snapper. I incorrectly assumed it would be one of the healthier entrees on the menu, but it turned out to be decadently rich. I enjoyed every bite, although I probably would have enjoyed it just as much if the preparation had been somewhat lighter. The photo makes it look like a meager portion. It wasn’t. The food was layered on a large plate. My wife ordered the Grilled Kurobuta Pork Chop. The pork was cooked perfectly. Everything on the plate worked beautifully together, but it was heavy food for a hot climate, perhaps better suited for a Midwestern winter evening. After the appetizer, entrees, delicious fresh breads, and a glass of wine each, we decided against dessert. We returned to ‘AMA‘AMA two more times the same week. Both times were for lunch. 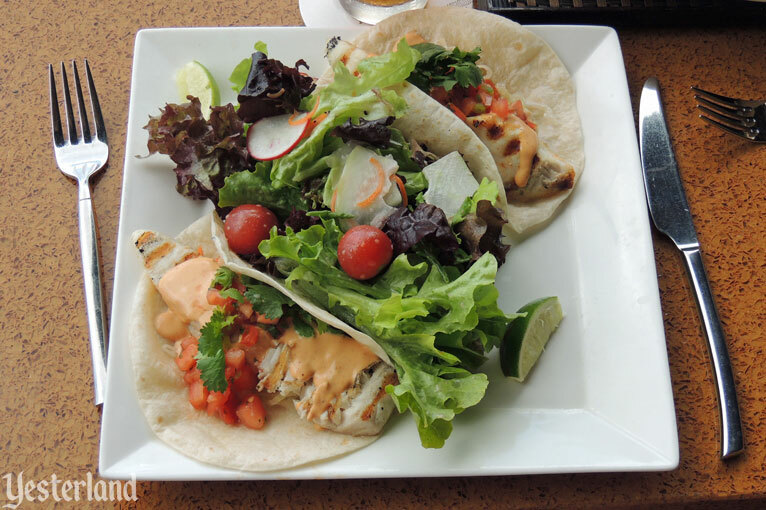 A manager at Makahiki, the other table-service restaurant at Aulani, told us the fish tacos at ‘AMA‘AMA are so good that he’s come to Aulani on his day off just to order them. It was good advice. My wife took his advice—and was glad she did. The fish that day was monchong. I chose the special of the day. In Hawaii, a popular lunch option is called the “plate lunch.” Local quick-service chains and mom-and-pop storefront eateries sell large portions of Asian-inspired chicken, seafood, or beef, served with two scoops of white rice and a scoop of macaroni salad. It’s not gourmet food, put it’s fast, filling, and usually quite cheap. 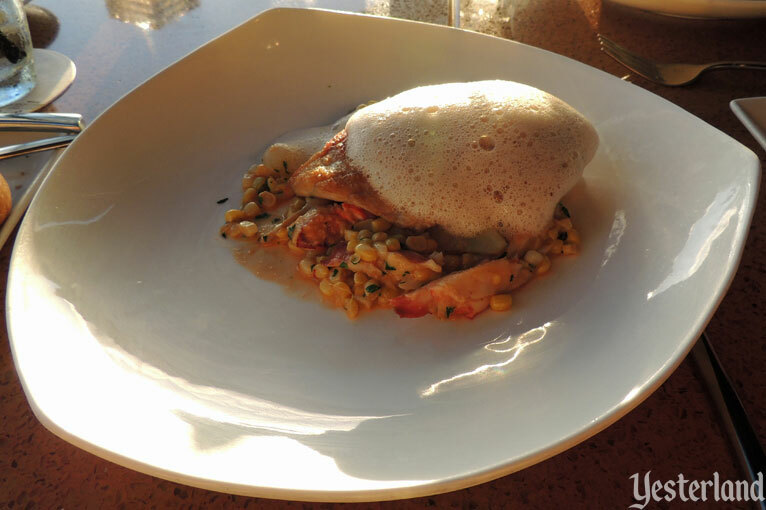 ‘AMA‘AMA has elevated the plate lunch to signature restaurant fare. Every day, a “daily plate lunch” is based on available ingredients and how they inspire the Chef. I’m sure there are eventually repeats, but there’s not a set pattern. 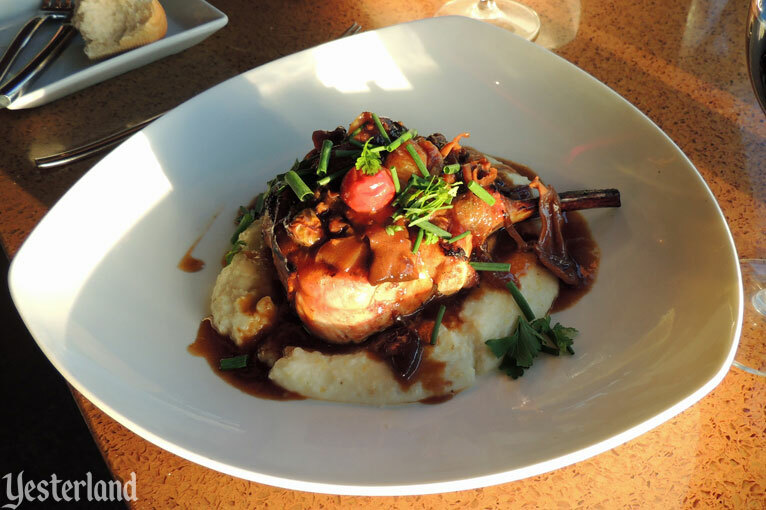 With the elevated food (and the spectacular location), there’s also an elevated price. 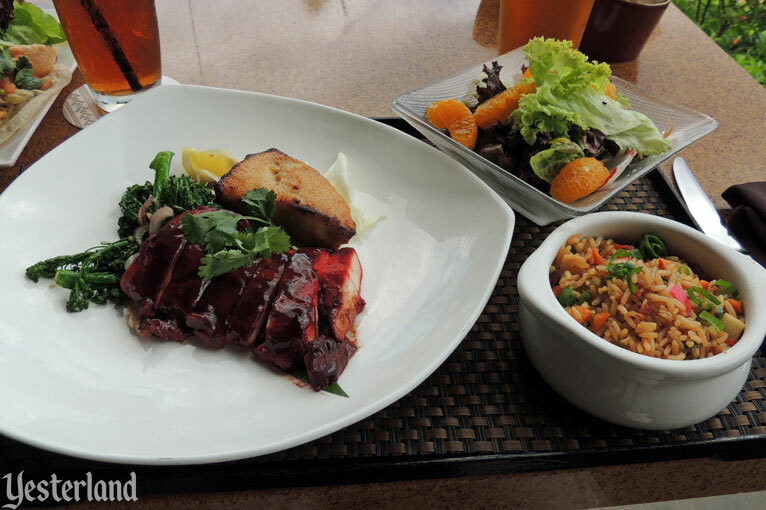 Our server recited the plate lunch for the day: Misoyaki Opah, Char Siu Chicken, Fried Rice, and Mandarin Orange Salad with Honey-Papaya Seed Dressing. It sounded great—and it was great. We returned to ‘AMA‘AMA for lunch a few days later. This time we were joined by Mark Hickson, the former Disney Imagineer who now publishes the excellent Disney by Mark (“Your Independent Disney News Source”) news site. 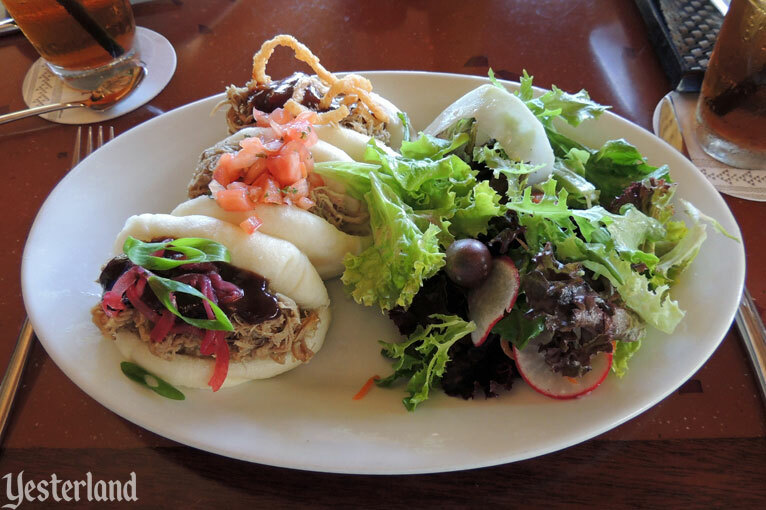 I ordered the Kālua Pulled Pork Sandwich. Traditional kālua pork involves a whole pig, wrapped in banana leaves, buried all day in a hot imu (pit oven). The slow cooking makes the pork tender and juicy. I doubt ‘AMA‘AMA buried a pig in an imu for my sandwich plate, but the pork was delicious. Each of my three sandwiches was finished differently, providing three variations on the same idea. 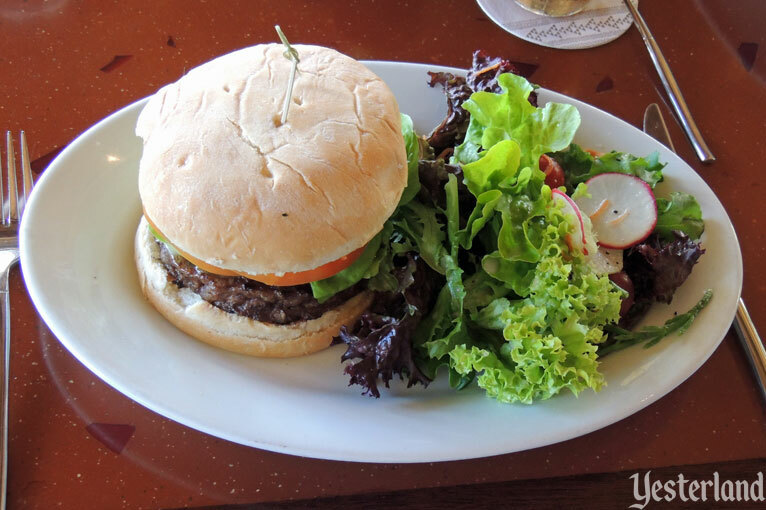 My wife likes a good hamburger—and she was very happy with the one served by ‘AMA‘AMA. Sandwiches are served with a choice of Sweet Potato Fries, French Fries, or Island Field Greens. 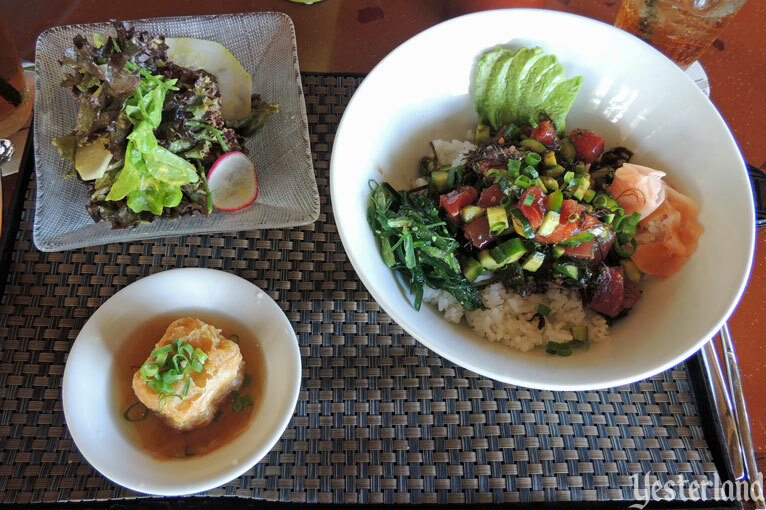 Mark enjoyed his plate lunch of the day: Ahi Poke Bowl with Baby Cucumber, Hawaiian Seaweed (Ogo), Wakame, Soy Sesame Chili Sauce, Topped with Goma Konbu, and Served with Sushi Rice. It also included Fried Tofu with Hon-Dashi and Scallions, as well as a Small Field Green Salad, with Honey Papaya Shiso Vinaigrette. I enjoyed our dinner at ‘AMA‘AMA, but the restaurant was even better at lunch. Someday, I’ll be back for breakfast.